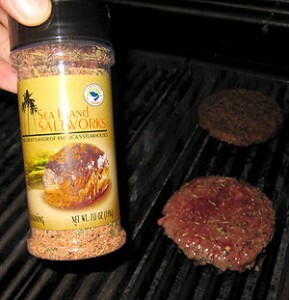 Sea Island Salt Works makes some nice and tasty spices and rubs for beef and other kinds of meat. I’ve had some SISW on steaks, burgers and chicken and it adds a nice personality to the flavor, without overpowering it. Two nights ago I cooked up a hamburger (front) and a veggie burger (back) with some Sea Island Salt Works and they were both quite enjoyable.